An introductory music theory course designed specifically for children. 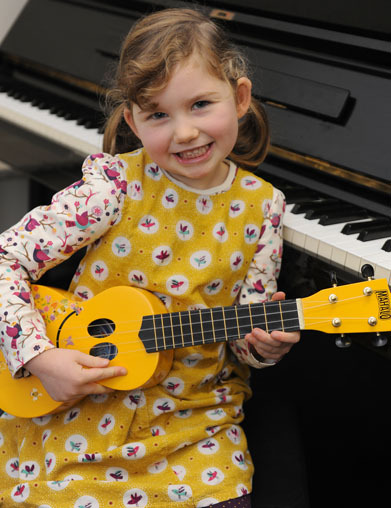 Through fun and game activities, children will learn the basic fundamentals of music which will fully prepare them for instrumental tuition in year two. Children will be exposed also to music of different cultures and genres, helping therefore to expand their understanding of what music involves prior to learning an instrument. Following on from year one, step two is designed to pair children with a selected instrument and teacher. Currently we offer classes in digital piano, violin, guitar, ukulele, drumming circle, drum-kit and voice. Through the promotion of group tuition, children will enjoy the dynamic of learning their selected instrument together. With carefully designed instrumental classes, children will benefit from learning music from all genres in music. At Music4Children we facilitate examinations with the Associative Board, London College of Music, as well as Trinity College London. In accordance with both steps one and two, ensemble work will also be encouraged. This will take the form of choral and instrumental initiatives including public performances at the end of each year. Release your child’s potential with music.